A food enthusiast, hard-working and humble, Bruce Hui is the culinary brain behind Yào Restaurant and Rooftop Bar, Bangkok’s first modern Chinese influenced multi-level hot spot at Bangkok Marriott Hotel The Surawongse. 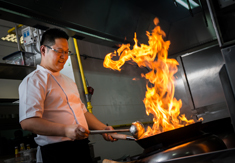 Born and raised in Jiangsu, an eastern-central province in China, Chef Bruce began his career in 2000 as a chef at Hubin Hotel The State Guesthouse in his hometown. Later, he was hired to work for many international hotel brands. In 2012, Chef Bruce decided to make his big move to join 5-star hotel in United Arab Emirates. He continued to pursue his culinary dream in foreign countries and moved to Thailand in 2015 to join Radisson Blu Plaza Bangkok as a Chinese Head Chef. In November 2017, he made another move to join Bangkok Marriott Hotel The Surawongse as a Chinese Head Chef. 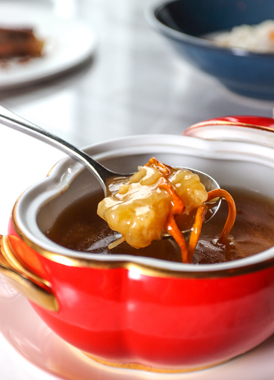 Chef Bruce’s passion is to develop and refine the traditional Chinese food recipes, the chef needs to make sure that the diners can deeply appreciate the profound nature of the Chinese food culture, yet not adhere strictly to tradition. In terms of the presentation, he stylishly presents his dishes in a simple yet sophisticated style by minimizing the use of excessive decorative items and highlighting the main ingredients. Leading the culinary team from a pre-opening stage, the Chinese Head Chef dedicates his knowledge and experiences to the restaurant’s distinctive food concept with an extra effort devoted to each menu, and he is excited to present his culinary creations to discerning guests from across Thailand and around the world. Soak fish maw in water for about 2 days until soft. Add all of the seasonings into the chicken stock with some potato starch. Transfer the soft fish maw into the chicken stock and steam for about 2 days until the fish maw gets well cooked. Turn off heat and serve.